Email marketing software systems play an integral role in boosting a company’s brand awareness. This platform allows companies to effortlessly tap existing and potential clients by automating the creation and sending of irresistible promotional materials, newsletters, ads, and much more. It also keeps businesses connected with clients through well-designed emails either created with prebuilt templates or drag-and-drop editors, or a mix of both. Generally, email marketing software allows users to easily share content to their subscribers through the automated sending of emails with customized designs with one’s branding and call-to-actions. Most also allow targeting of specific clients for high conversions. Email marketing platforms also allow users to track and create insightful analytics on marketing performance, allowing you to gauge which worked best and the factors that influenced the results. Email marketing is largely used today, and for good reason. Confidence and reliance on email marketing are largely hinged on a large number of email users. Data from Statista shows that there are a total of 3.82 billion email users globally in 2018, with the numbers projected to reach 4.1 billion by 2021. With this data, everyone can clearly see why most businesses rely on email marketing, including B2B marketers. Email continues to be the most widely used B2B content marketing strategy. Compared to other content distribution media, email marketing offers the highest ROI, generates the highest revenue, and directs the highest number of leads. Because organizations and enterprises can use email marketing to reach thousands of users, if not millions or billions, we have created this top online email marketing software list. This mostly comprises of software systems that help you expand your reach for better conversions or tap existing clients for better re-engagement. One of the leading online marketing software is Active Campaign, but there are also much more great options to choose from. Hence, we have created this article on 10 top alternatives to ActiveCampaign. ActiveCampaign is a user-friendly email marketing platform that dynamically spices one’s interaction with clients through engaging emails, complete with customizable automation functionalities based on client behavior, history, and interests. It also comes equipped with enterprise-grade sales and CRM features that provide a personal, yet predetermined sales process while identifying the best sales opportunities to close in. This helps eliminate mundane initial emails, thus helping you focus on replying to nearly-won deals and unique queries. ActiveCampaign allows users to track client behavior on your website not only to divide and group contacts, but also to trigger follow up campaigns based on certain actions. Information on client behavior can also be used to create personalized marketing that best fit each individual’s interest. Assessing one’s marketing performance can be done through ActiveCampaign’s split testing feature, allowing you to divide clients to pipelines with different processes to determine the best approach for your audience. Utilize an easy to use platform that excels in creating and sending engaging, personalized emails. Efficiently and effortlessly communicate with clients with an easy to use drag-and-drop flowchart tool for automated emails. Track client behavior to create personalized emails and send follow up campaigns. Seamlessly transition from marketing to sales with the help of ActiveCampaign’s CRM, which supports the platform’s automation capabilities. Hone in on high profile clients with an advanced lead scoring. Use split testing to determine the best automation process. Seamlessly utilize ActiveCampaign with over 150 built-in integrations. If you think this email marketing software is not suitable to your needs or lacks a specific feature that you require, you can check these top 10 alternatives to ActiveCampaign. HubSpot Marketing is designed to boost your website traffic and sales conversions through easy to use drag-and-drop web builder functionality, efficient SEO optimization, and engaging personalized messages with call to action. Email marketing is also engaging, providing users with dynamic tools to create HTML messages. You can also easily gauge your best leads through social intelligence based on interests and lifestyle. 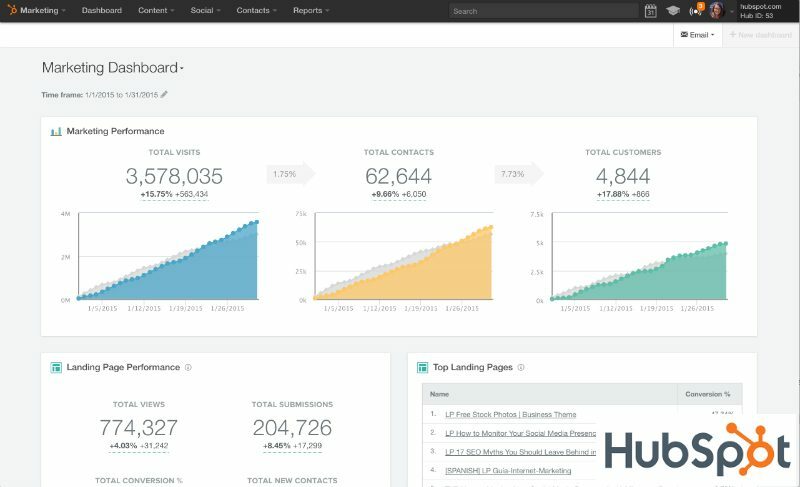 HubSpot Marketing supports integrations with marketing assets, and can be connected to HubSpot CRM or Salesforce. If you’d like to try out the software first the vendor offers a great free trial that lets you see all the key features in action. You can easily sign up for HubSpot free trial here. With HubSpot Marketing, you can also take advantage of its vast resource library to best utilize the platform. It also boasts a reliable customer support team composed of marketing professionals. Make sure to check out our HubSpot Marketing alternatives for more great choices. Utilize a platform that efficiently engages clients and boosts conversion through an easy to use marketing automation and website builder. Analyze marketing impact and performance alongside traffic data by simply inserting clients in your marketing funnel. Easily integrate to HubSpot CRM or Salesforce to fully arm your email marketing. Utilize a platform that focuses on creating a dynamic and personalized emails to clients, with automation functionalities for behavior-based emails and actions. Use split tests to analyze efficiency of your marketing processes. Utilize over 150 built-in integrations to easily funnel your processes and workflow. Exponea, a cloud-based solution, is designed to improve customer experience through automated engagement powered by behavior-based analytics based on customer actions and interactions. This functionality fully leverages the power of the cloud, allowing users to obtain a holistic behavior profile for each individual to created automated actions, thus making tapping countless leads for better conversions an effortless task. Creating a spiderweb of conditions for automating emails and voucher sending is a breeze with Exponea’s drag-and-drop tools. If you want to try out the solution first you can easily sign up for Exponea free trial here. A notable feature of Exponea is its integration features, as it allows various storage options, such as cloud-based or on-premise. Integrating Exponea is also quick and easy, taking only an hour for setting up with full data operation from the ground up with no need to reach out to support teams for maintenance. Check our Exponea alternatives for other great online email marketing software systems that may best suit your business. Utilize a marketing software that specializes in improving customer experience through layered behavior-based automated interactions, including sending of vouchers and discounts. Have access to rich API for third-party integrations. Utilize machine learning capabilities for marketing. Utilize a platform that specializes in personalizing your emails with clients. Access over 150 built-in integrations. Use client behavior for personalized interactions. Marketo is a comprehensive marketing platform that allows businesses to easily engage their customers through functionalities such as marketing automation and marketing management. With Marketo, users can have one-to-one marketing through a smart marketing database that illustrates a holistic view of each client’s preferences, with each customer having an individual profile. This is done through data capture forms, which allows for quick client profiling. Other standout functionalities of Marketo include the “Forward to friend” social component, email testing, drag-and-drop interface for creating landing pages, and aggressive lead management through predetermined parameters. You can also trigger multi-step workflows based on performed client actions on your website, create landing pages with a drag and drop interface, and utilize visual analytics for individuals or across channels. For more quality brands, make sure to check our list of Marketo alternatives. Utilize a flexible platform for marketing automation, customer engagement, and marketing management. Benefit from native integrations with leading CRM platforms. Gather marketing analytics based on various results such as lead performance and landing page performance. Utilize a platform that specializes in creating personalized emails to clients. Benefit from over 150 built-in integrations. Use email split testing to test each campaign. iContact Pro made it on list of top 10 alternatives to ActiveCampaign as it effectively allows small to large-sized businesses to utilize an easy to use advanced marketing automation suite that personalizes email marketing through triggered email messages. With iContact Pro, sending of emails and starting social media campaigns can be scheduled or automatically started based on client information and client interaction with your website and social media pages. iContact Pro also makes landing page creation a breeze you to create landing pages based on templates or HTLM-based pages. Make sure to check our iContact Pro alternatives for more quality options that may best suit your business. Utilize a platform that automates sending of personalized emails through triggered messages. Integrate with leading business systems, including Salesforce. Observe campaign effectiveness with its robust analytics and A/B testing. Utilize a platform that specializes in creating personalized emails through event tracking. Integrate with over 150 built-in applications. Test campaign effectiveness with split testing. Salesforce Marketing Cloud is a renowned marketing platform that allows users to take their clients on a personalized journey. Information on customers is unified, with Salesforce Marketing Cloud collecting data from CRM and analytics to illustrate a detailed profile. This information can easily be actioned upon with drag-and-drop tools to easily segment users. Email automation is a breeze through using email triggers based on customer behaviors. Push notifications and targeted ads can also be sent automatically based on collected client information. Social media marketing is another strength of Salesforce Marketing Cloud, as it allows businesses to boost digital marketing alongside social listening and analysis. For more good choices, make sure to check our Salesforce Marketing Cloud alternatives list. Utilize a powerful marketing digital platform that specializes in creating a tailored journey for clients, complete with a powerful social media marketing tool. Take advantage of email triggers based on client behaviors, with push notifications and targeted ads to further boost your interactions. Access top business systems and applications such as Shopify and Workfront. Utilize a marketing automation platform that specializes in creating and sending engaging, personalized emails. Take advantage of event tracking to create personalized emails, complete with images and videos that suit their interests. MailChimp is a popular email marketing platform that offers affordable plans for businesses of all sizes. With MailChimp, you can easily create campaigns that best reflect your company message using your own marketing tools or pre-built templates, automate marketing to eliminate mundane manual tasks, and take advantage of vast analytic tools to gauge your campaign performance. Other features of MailChimp includes support for mobile devices, various materials for creation of email marketing campaigns, dividing and categorizing mailing lists, and much more. If this platform doesn’t suit your needs, make sure to check out other MailChimp alternatives. Benefit from an affordable email marketing platform with fixed pricing plans based on the volume of subscribers. Use pre-built automation to build your brand, connect with your clients, and convert them into customers. Utilize A/B Testing and Multivariate testing to gauge your campaign and track your performance with interactive graphs, activity reports, and more. Benefit from a marketing platform with fixed pricing plans based on the number of users. Personalize your email marketing using an automated platform that sends promotional materials that suit your client’s interests. Utilize split testing to gauge campaign performance. AWeber is designed with ease of use in mind, allowing businesses to effortlessly send professional-looking emails with a vast collection of email templates, coursed through autoresponders and automated schedule-based followups. Personalizing your own subscriber lists can also be done, allowing you to insert pertinent information for a neat overview to help you make informed decisions. AWeber also regularly hosts live webinars and provides instructional materials to help you in your marketing efforts. For more great options for your marketing needs, make sure to check out our AWeber alternatives. Connect with clients with predesigned templates for professional-looking emails coursed through smart autoresponders and automated schedule-based followups. Neatly organize and personalize your client list per form, while inserting important information to help you make informed decisions. Benefit from pricing plans based on number of subscribers. Connect with clients through personalized emails based on each client’s preferences, with email automation easily done using a drag-and-drop flowchart tool. Automate emails based on information derived from its event tracking functionalities, allowing you to concentrate on personally responding to unique inquiries. Benefit from pricing plans based on number of users. Constant Contact is a cost-effective marketing solution that allows you to keep clients engaged through personalized emails with hundreds of configurable templates along with automated email triggers for scenarios such as events or milestones. Facilitating end-to-end contact management is also effortless as the application facilitates neat arrangement of your leads while also handling all lost deals such as inactive emails and unsubscribes. All of these functionalities can be done on a single dashboard. Aside from being able to benefit from its flexible pricing plans, being a user of Constant Contact has its perks, as you are granted access to live webinars and lengthy courses to ensure you maximize your marketing campaigns. Make sure to check our Constant Contact alternatives for more great options for your marketing needs. Effortlessly engage clients through personalized emails with configurable templates. Use a drag-and-drop builder for configuring email templates, with marketing automation promptly started after inserting clients in your contact list, thus also allowing them to receive materials for scenarios such as milestones and events. Easily gather your contacts from various databases into a unified list, with the application taking care of lead segmentation. Easily engage clients with personalized emails based on tracked client behavior on your website, thus enabling the application to appropriately send content based on their preferences. Use an intuitive drag-and-drop flowchart tool for powering your email automation. Smoothly transition from marketing into sales using the application’s automation tools. Mailjet is an intuitive platform designed for easy optimization of marketing campaigns and effortless sending of emails with a drag-and-drop editor to quickly vary messages for each user based on location, behavior information, and more. This allows you to proficiently reach out to your customers with a personal touch. It also comes equipped with marketing automation, allowing you to create customer journeys and easily welcome new users for a better relationship. With Mailjet, you can also rely on expert support from delivery experts who can help create advanced workflows for your marketing campaign. For more suitable choices, make sure to check our Mailjet alternatives. Utilize a drag-and-drop editor for building your emails. Take your customers on a journey with custom workflow, with Mailjet’s team providing extra deliverability support for advanced workflows. It includes pricing plans based on volume of email distribution, with the highest tier including expert deliverability support. Startups can also take advantage of a free plan. Automatically tailor emails that suit each users’ preferences with the help of event tracking. Utilize a drag-and-drop flowchart tool for creating your custom workflows, with event tracking taking care of email automation so you can focus on responding to unique queries. It includes pricing plans based on total number of users. If you’re looking for a way to handle lead generation and email marketing on a Wordpress-powered website, MailOptin is the right platform for you. It focuses on growing your email list with various engaging and highly customizable opt-in forms while nurturing subscribers with professionally-designed email newsletters and notifications that are hassle-free to send thanks to the platform’s automation capabilities. Unlike other plug-ins, MailOptin brings all these functionalities without sacrificing website performance, ensuring that all visitors have a smooth and seamless experience on your website. For other great selections of email marketing solutions, make sure to browse our MailOptin alternatives. Utilize opt-in forms with click-optimized call to action buttons for acquiring subscribers. The various opt-in forms can be customized to better-suit your marketing and branding, and you can toggle delayed time triggers so your opt-in forms appear at the right moment before visitors exit your website. Automated sending of newsletters and email notifications whenever you publish a new post on your website. Considering not everyone checks all their emails on a daily basis, MailOptin’s email digests with a weekly round-up of articles to ensure your subscribers are up to date with your latest articles and offers. Take advantage of page level targeting to display opt-in forms on specific pages or categories on your website. Easily transition from sales to marketing with its built-in CRM functionality. ActiveCampaign’s event tracking capability ensures you deliver the right personalized message that captures the interest of your audience. Directly engage with potential clients via email automation, thus effectively eliminating mundane initial emails. Email automation is easily set-up with a drag-and-drop flowchart for easy segmentation of potential leads.